Two dozen roses arranged. 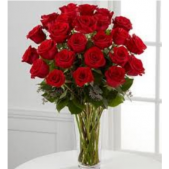 We carry the largest selection of fresh roses anywhere in the south bay area! We guarantee our roses and never deliver them in a box...rather hand designed by floral artists. A variety of colors are available, but red is always a traditional favorite.